Why does anyone in New York buy ties fully priced? 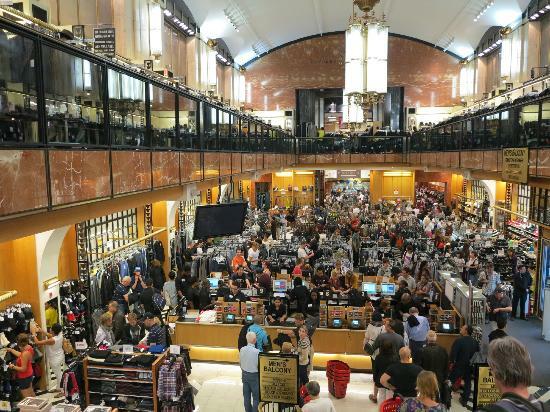 I’ve been here a good seven or eight times in my working life, but the discounts at Century 21 and to a lesser extent Filene’s Basement never cease to amaze me. The ties are carefully arranged into price categories, from around $30 to $60. It compares to full prices of around $70 to $180. At one end Van Heusen and a few names I haven’t heard of; at the other Ferragamo, Louis Vuitton and Ralph Lauren Purple Label. All are reduced by somewhere between 60% and 80%. It must harm your impression of a brand that its most luxurious items are being sold at a very heavy discount, all year round. Why would you then go to the Ralph Lauren block of stores uptown and not balk at paying near to 100 pounds for a tie? This discounting does happen in the UK. But it is largely in out-of-town shopping centres like the York or Bicester designer outlets. Somehow it’s almost acceptable if the discount stores aren’t in the same city. Plus, they are all still separated by brand, surrounded by their usual furnishings, shop furniture and advertising. This could serve to undermine the brand even further – as it is exactly the same kind of shop you would buy fully priced items from. But instead it seems to make the experience more special, unique. The racks and racks (sometimes piles) of closely stuffed clothes in Century 21, on the other hand, just seem to cheapen the whole experience, to lower Purple Label and Vuitton down to the level of the cheapest high-street store. This level of discounting often happens with women’s clothing out of season – in the increasing number of designer vintage shops, for example, and online. But women care far more about how up to date their clothes are. Fashion and its fickle seasons mean one would never buy a trendy piece from two years ago – it would look like it was two years old, and you haven’t bought anything since. Even men’s clothes could be seen as going in and out of season. Polo shirts and cardigans, bright colours and drainpipe jeans, all will probably find their way into discount stores after a while, unwanted and so pushed off by labels more interested in the new season, only concerned with cutting their losses on the old stock. But men’s ties? Apart from a slight variation in width, how on earth do these go out of fashion? Besides, you can get super wide Purple Label ties and super narrow Black Label ties on the same rack – everything is covered. The same discounts apply to handkerchiefs, socks, underwear, cufflinks. So I’m sure I’ll be buying a few. Less because I want them. More because it seems too good to be true – there’s nothing like this in London and I have a slight suspicion someone might realise what’s going on at any minute and close the place down. You can follow the discussion on An Englishman in New York by entering your email address in the box below. You will then receive an email every time a new comment is added. These will also contain a link to a page where you can stop the alerts, and remove all of your related data from the site. You should see what’s outside of NY. Century 21 is a little steep for me not to mention the zoo factor of tourists and ex-Warsaw Pact citizens screaming at each other in their native languages from great distances. Haven’t found shoes yet but I suspect they’re coming. Nice blog you.